He came out to bat at 24 for 4 in 5.5 overs. CSK, set 152 for victory, were in dire straits needing 128 more to win in 85 deliveries at a required run rate of 9.03. By the time he was dismissed CSK had reached 144 for 6 in 19.3 overs needing just 8 runs off the final 3 deliveries. A last-ball six ensured a thrilling victory – their sixth in seven matches - and consolidated CSK’s position at the top of the points table. It was a win whose foundation had been laid by MS Dhoni - in partnership with Ambati Rayudu. It was a quintessential Dhoni innings under pressure – soaking the pressure of early wickets, resurrecting the innings and building a match-changing partnership with Rayudu (57 in 47 balls) increasing the tempo later in the innings. It was Dhoni’s 100th win as captain in the IPL – the first skipper to reach the landmark. Dhoni also has the highest win percentage as captain in IPL history – 60.24%. He is followed by Rohit Sharma (57.45%) and Gautam Gambhir (55.04%). Dhoni and Rayudu were cautious and tried to get the innings back on track after the early flurry of wickets. From 24 for 4 (in 5.5 overs), CSK had moved to 40 for 4 in 9.1 overs – the pair adding just 16 runs in 20 deliveries in this period. Dhoni was unbeaten on 5 off 9 deliveries when he unleashed his first big shot – depositing Shreyas Gopal for a maximum over long-on. CSK had just managed a mere 50 runs half-way into their chase. They needed 102 off the next 10. Dhoni slog-swept Riyan Parag for a flat six over deep mid-wicket in the 11th over before clubbing Gopal for another over long-on in the 13th. Rayudu hit a few lusty blows from the other end and CSK had marched to 101 for 4 after 15 overs. They still needed 51 off the final 5. From 5 off 9 deliveries, Dhoni had raced to 34 off 25. He had added 29 runs in 16 deliveries at a strike rate of 181.25. Gopal and Jofra Archer conceded just 5 and 7 from the next two overs. CSK now needed 39 off the last three overs at 13 runs per over. Dhoni pulled Ben Stokes over deep square-leg for a six off the second delivery off the 18th but the bowler came back well and saw the back of Rayudu in the same over. 30 runs were needed off the final two overs. Dhoni had kept CSK in the hunt. However, the CSK skipper was now struggling and was running out of steam in the severe weather conditions in Jaipur. He continued to run hard between the wickets even though he was not being able to find the strength to hit the boundaries. 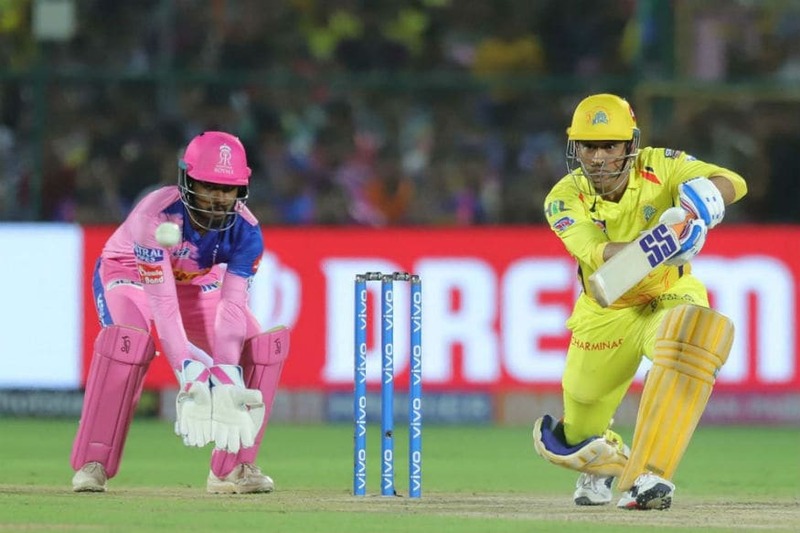 Dhoni, clearly gasping for breath, still sprinted for three consecutive twos – a testimony of his grit and determination to win the match for CSK. A lucky boundary off an inside edge to fine-leg off the last ball of the 19th over from Archer meant that CSK needed 18 off the remaining six deliveries. Ravindra Jadeja smashed a six off the first ball of the 20th from Stokes. It was CSK’s match from thereon. Dhoni was dismissed off the third ball for 58 off 43 deliveries (strike rate of 134.88) but by then had done the job for his side. The last over saw some drama – a no-ball, a revoked no-ball and a last-ball six from Mitchell Santner. CSK won a cliff-hanger. The 95-run partnership between Dhoni and Rayudu was a match-winning one for CSK. Dhoni contributed 44 off 35 deliveries while Rayudu matched him neck to neck with 45 off 36. Dhoni paced his innings to perfection. He was circumspect at the start when CSK had lost early wickets, accelerated in the middle but then passed the baton to the likes of Rayudu and Jadeja when he ran out of gas and went off the boil at the death. Dhoni is the leading scorer for CSK this season with 214 runs in 5 innings. He also leads the average (107) and strike rate (127.38) charts (min. 50 runs) for his franchise. 32 not out of 35 deliveries in a tense but successful chase, unbeaten 75 off 46 and 37 off 23 deliveries batting first providing the impetus at the end and finally 58 in 43 deliveries under pressure of having lost early wickets and a climbing required run-rate – Dhoni has once again silenced his critics with his performances. India would hope that he can replicate his success when he changes his jersey from yellow to blue in a little less than two months from now.